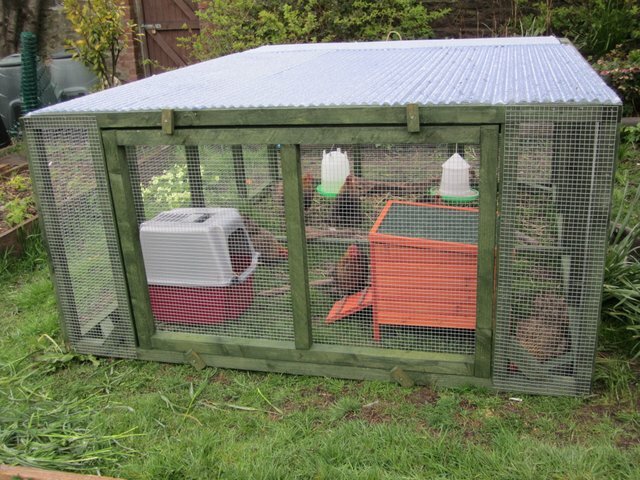 The Moppet House is quite sturdy, but I really should have pinned the corrugations across, rather than along, the run … when it rains, the water runs down the length of the house and lands on your back as you are leaning inside to collect eggs or clean out the hutch! If ever I need to replace the plastic, I’ll add another support so I can put it across, but I don’t think it’s worth removing it now just to do so. I knew the feeders were under the one point water can get in through the roof … and it did! So for now, the Moppets have their pellets in a trough out of the way of the leak. Once I insert another door at the far end, near the hatch, I’ll add some more hooks to have the feeders under the solid roofing. They won’t be quite as easy to reach, but I also plan to purchase some chain, cut to length, to suspend the feeder and drinker … that way it will be easier to hang them at arm’s length. Perhaps I’ll also use chain as a stay for the hatch. I still haven’t decided the best way to roof the hatch … I’m going to a DIY store tomorrow to buy the wood for the door and the chains, so I’ll have a look round then. And for some way to lift the hatch – at the moment I’ve stapled a loop of string to use as a handle! I love this little setup. And I love how our chicken coops and Moppet Houses are never quite right. It’s a creative process, punctuated by these hilarious little creatures causing trouble every step of the way. Your “moppets” are gorgeous and so sweet looking. I’m truly glad you went forward and started a new flock after the tremendous heartbreak. You’re a strong one! We too only found the design faults as we went along, it’s tricky to get everything right from the start. We have improved our set up time and time again and are still tweaking it a year on. We are going to look (LOOK!) at some bantams today. 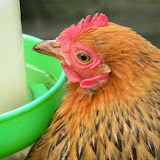 I am thinking of adding two to our little flock. 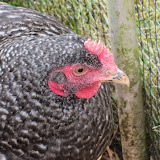 I like the look of vorwerk and wyndotte, no feathered legs is a criteria for me, to avoid muddy leg feathers. Your moppets are just adorable though!